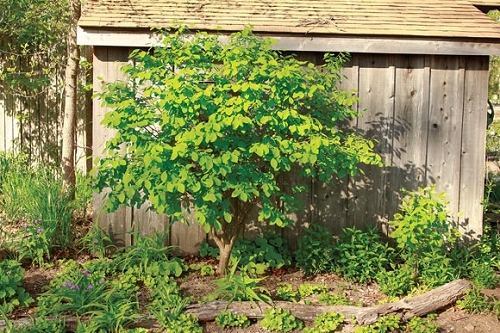 An outstanding 4-season shrub. Yellow leaves in fall. Small tree-like appearance in winter. Specimen plant for shade. Q: Would this tree be appropriate in a full sun location in Hollister, MO? A: No, it wouldn't do well in full sun. The leaves will likely turn yellow, and the plant will go dormant earlier than normal. It will do well in direct morning sun for a few hours, but will need shade during the hot afternoon.